Brookfield Zoo senior animal care specialist Melissa Zabjonik crouches poolside and calls over Spree, a 14-year-old female dolphin. It’s just before 10 a.m. Wednesday. Every day at about 9:30 a.m. or 1 p.m., the zoo’s eight bottlenose dolphins get a personal care session from Zabjonik and other specialists, who examine each dolphin from beak to tail, looking for changes to the skin, eyes, teeth or any other part of the body. Every so often, staff take samples of a dolphin’s blood or blubber. As of late, these daily check-ins have also featured a new Fitbit-like device that figures to revolutionize human understanding of the animals’ behavior, providing data on their speed and acceleration, distance traveled, where they’re spending time in the pool and more. 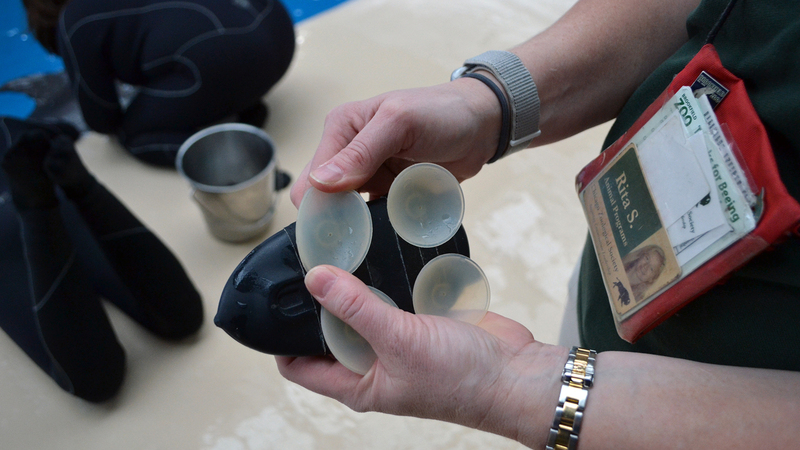 The sensor chips are tucked into an oval-shaped protective case and attached to the dolphin’s back using four suction cups specially designed to prevent damage to the skin. Holding Spree’s dorsal fin with one hand, Zabjonik uses her other hand to place the case holding the sensor onto the dolphin’s back, between her blowhole and dorsal fin. Zabjonik then presses down on the case, and the task is complete. The Chicago Zoological Society, which manages Brookfield Zoo, announced this week a new $740,000 study that will use the sensors to collect data on hundreds of aquatic mammals in order to improve the facilities, training programs and other factors that shape the animals’ lives. The study, funded by a grant from the Institute of Museum and Library Services, spans 44 institutions in seven countries and will involve 7,000-plus hours of data collected from nearly 300 dolphins and 20 beluga whales. According to CZS, the study is the largest multi-institutional study to date of how physical habitat, environmental enrichment and animal training impact the welfare of aquatic mammals. “It’s super exciting because it’s taking the observations that I can do to another level,” said Lisa Lauderdale, a postdoctoral fellow in CZS’ Animal Welfare Research department and one of six lead investigators of the study. The technology behind the sensor, known as bio-logging, has long been used to study animals in the wild but is only now being applied to animals in managed environments, said Lance Miller, the zoo’s senior director of animal welfare and also a lead investigator of the study. In zoos and aquariums, strategies for animal care have traditionally been based on smaller-scale research projects, along with the expertise of specialists. “Normally, when we want to watch their behavior, we have to have a person physically in the [observation] window, writing down what behaviors they’re doing,” Stacey said. “This will give us the information like that,” she said, making a snapping noise with her fingers. The device – about the size of the face of a watch – has been developed over 15 years by a team of researchers led by Alex Shorter, assistant professor of mechanical engineering at the University of Michigan. Each device includes sensors to measure acceleration, speed, pressure, orientation and angular velocity. Coupled with video from two customized cameras installed on the ceiling of Brookfield Zoo’s Seven Seas Dolphinarium, the sensors will offer a wealth of information about the dolphins’ movements. Algorithms developed by Shorter’s team will help make sense of all the data, allowing staff to better understand variations in the animals’ behavior. Zoo staff will also look for behaviors picked up by the overhead cameras, which can detect movements down to the bottom of the 25-foot-deep pool. The information will provide clues into the dolphins’ social behaviors and patterns, Stacey said. The sensors are currently being shipped to nearly four dozen zoos and aquariums worldwide that are participating in the study, including Chicago’s Shedd Aquarium. “The idea is to make [the devices] as inexpensive as possible,” said Shorter, adding that the cost to develop the devices has limited their use to individual research projects. Research from the study, which also involves measuring hormones and other biomarkers of health and welfare, is expected to be published in 2020. Dec. 14: From siblings with snowballs to wrestling chimpanzees, playful behavior is usually easy to spot. But the question of why we play – and whether we all play for the same reasons – is less apparent. Nov. 16: A Mexican wolf pup born this spring at Brookfield Zoo and released into the wild as part of a species recovery program was tracked down in New Mexico and is healthy, the zoo announced this week. June 13: Customized activity monitoring devices are helping Brookfield Zoo staff study sleeping patterns and other behaviors in giraffes.